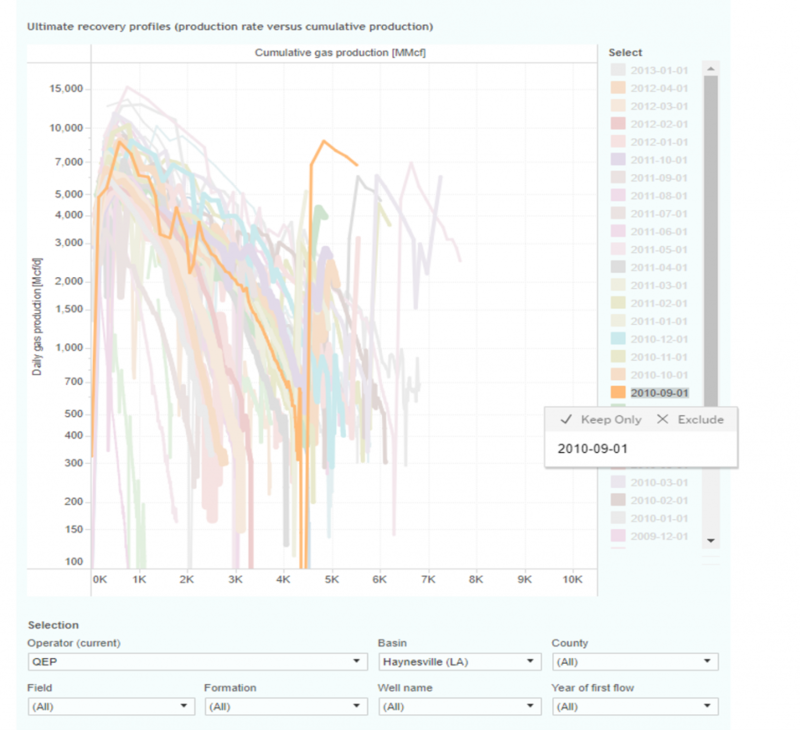 This interactive presentation contains the latest gas production data from all 3217 horizontal wells in Louisiana, that started production since 2007, through July. Gas production in Louisiana, with the Haynesville basin being the largest contributor, is rising in 2017 at its strongest pace since 2011. As you can see from the above chart, production from especially older wells is suddenly growing again. The reason behind this is that operators are returning to the Haynesville to refrack these existing wells. If you go to the 3rd tab (“Well quality”), you can see this in more detail. The end of the tails of the production curves from the 2008-2011 vintages are jumping upwards. 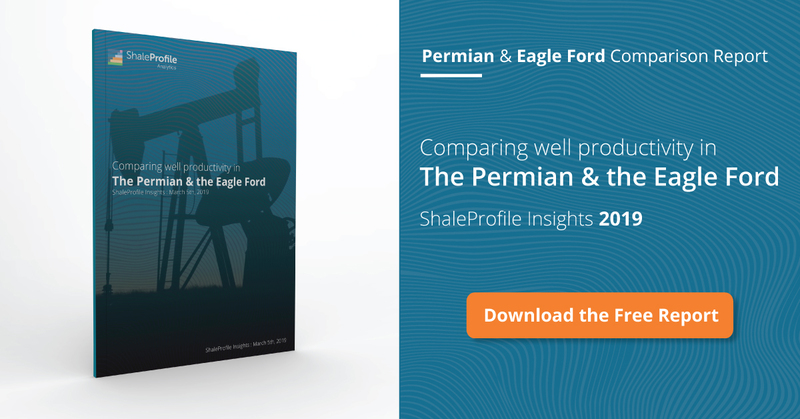 Another interesting finding is that newer wells are far more productive than older wells. 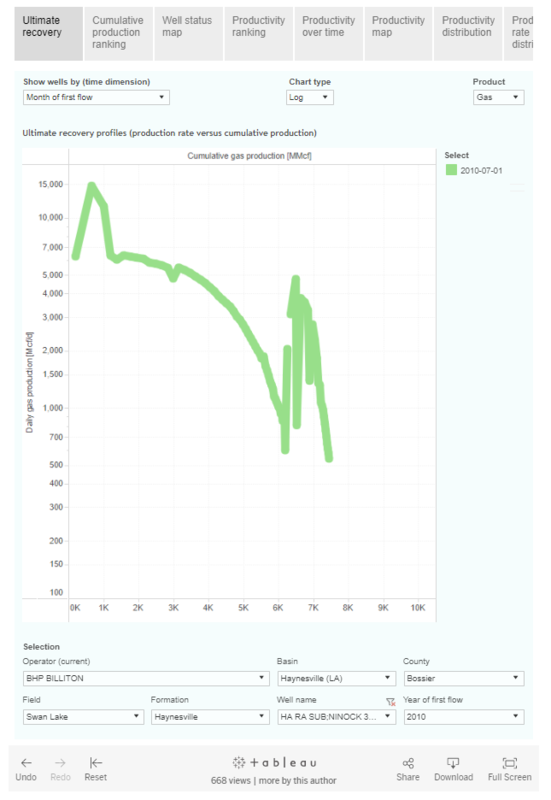 As you can see in the bottom graph of that overview, the average 2016 well has produced more gas cumulatively before 20 months on production, than the total cumulative production from any of the earlier vintages (on average). This “Ultimate Return” overview shows these recent improvements even more extensively. Wells are grouped by the month in which they started production. Although the chart looks messy due to the great number of curves, if you go through the list and click on any of the recent months, you’ll see that all those curves on the top are from wells that started some time since the middle of last year. 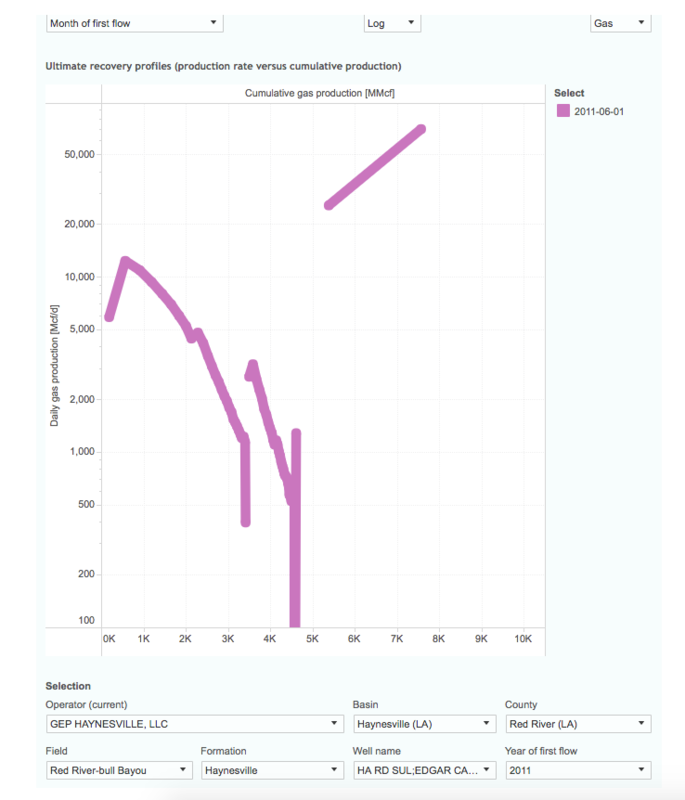 They’re obviously on track to greater recoveries than the earlier wells during the original boom in the Haynesville. 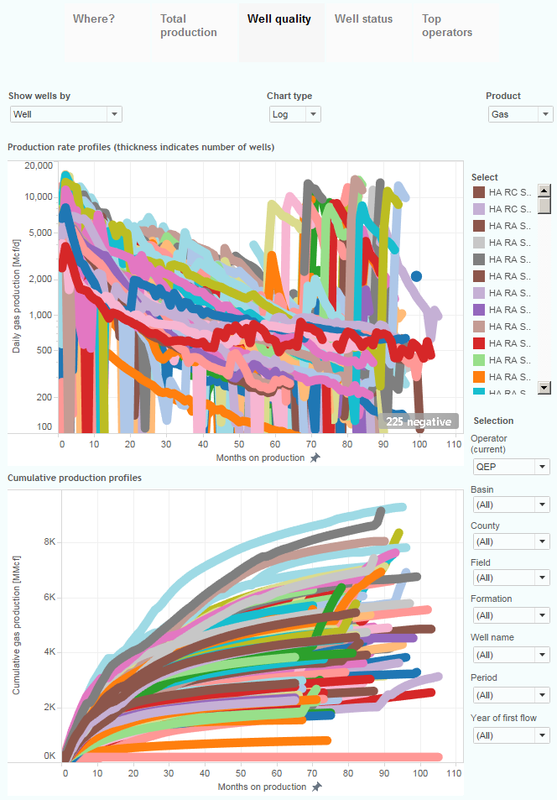 The “Cumulative production ranking” tab ranks all these wells according to cumulative gas production. Individual well production is estimated from lease production, and well status data (including regular well tests) in Louisiana as well level production data is not available. If you go through the list, you’ll see that almost 20 wells have now recovered more than 10 Bcf each. By Wednesday next week I should have another post on the Niobrara ready. Enno keeps on bringing in interesting and exciting new results through the vivid data and plots! 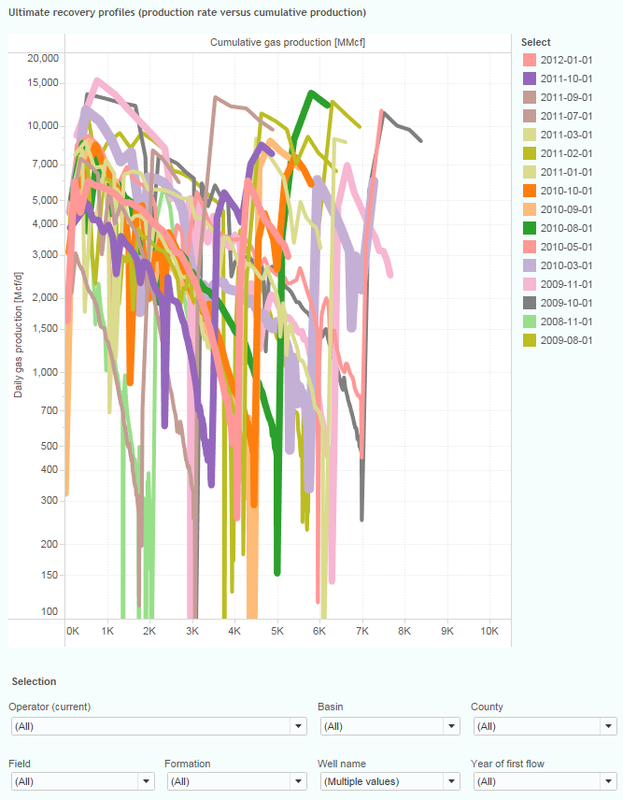 It’s amazing to see the first basin wide production decline reversal caused mostly through refracing old wells. Could this implies that the cost of refracing is below the wellhead prices now? First, thanks Enno for the great site and data. Found about 10 wells that were drilled in 2010 and re-frac’d in the Bossier area. This is the best one. Shows just how much gas they get from re-frac’n. Looking at the data…. Is it worth it to re-frac???? Doesn’t look like it to me, well unless re-frac’n is way cheaper than initial frac’n. If anyone has newer wells that were re-frac’d post them please. Interesting stuff. QEP reported in Q1 2017 report that their 11 well refrac program averaged 24-hr IP after refrac at 11.5MMCF, and average 90 day at 7MMCFPD, average 180 day at close to 6MMCFPD. These results are not that bad. 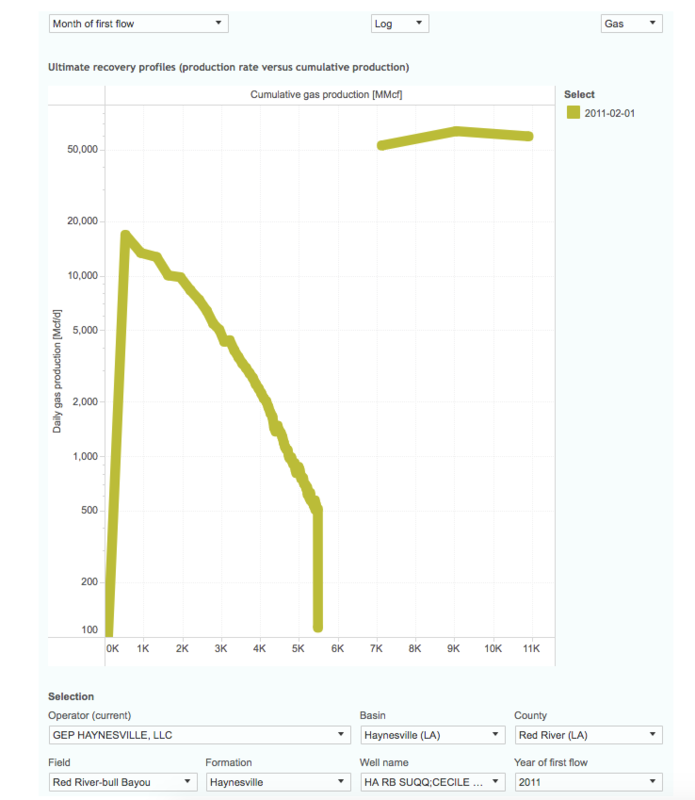 Forgot to add that well’s re-frac’d production was done 25 months ago. Water, sand and horsepower has not gotten significantly cheaper in the past three to four years; actually given the demand for frac spreads at the moment the horsepower part of the equation has become more expensive. I have yet to see any consistent example that re-frac’ing is proving economical in any shale basin. For those fixated on productivity, and not profitability, the Haynesville of late is impressive. But last time I looked all unconventional shale development in the US, oil or gas, was run by private enterprise and to be sustainable, private enterprise must ultimately be profitable. Throwing good money after bad, using credit, and stuffing more sand into an old well bore does not define improving technology and the price of gas is now <$3 bucks per MMBTU. From the above, I’d estimate (very roughly) that the average extra recovery from these refracks is in the range of 4-8 Bcf. Another thing I found interesting is how different the production profiles are here, compared with e.g. the Marcellus. Here they appear to decline quite close to exponential. You can see that by switching to ‘normal’ (=linear) scale in the EUR dashboard, like shown below. A straight line on this plot indicates an exponential relationship. Using this setting may make it easier to estimate an UR range. This was exactly the thoughts I had in mind. 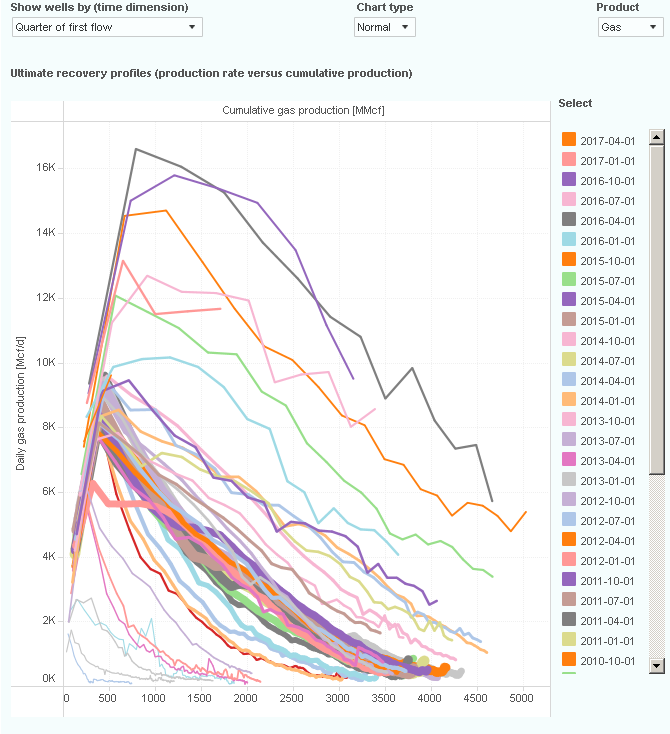 I was looking at both “production diagramms”, and it’s shocking how Haynesville have much steeper depletion rates than Marcellus. After 2 years, the average Haynesville production is depleted by 75%, while the Marcellus stand at 50%. Both have similar rig count and first flow rate… But Marcellus produces 3 times more than Haynesville because of this. Is this related to the geology only? Or is related to the way the operator drill and frack the well? 2. better 1st-time fracing and completion + longer lateral made the IP of new wells way better than before — wait till we see if the fast decline come back or not; if this could solve the fast decline, then technology improvement once again helps the EUR. With all the progresses, Haynesville might be able to compete with Marcellus again and grow at $3/MMCF price. This re-frac’ing program in the Haynesville has gotten the attention of the MSM, including the WSJ. 4-8 BCF is indeed impressive, if that be the case. Personally, before I vote I chose to disregard completely IP180’s and all that hubbub, see how quickly these wells decline, and wait for the UR. My perspective on this sort if thing, as an oil and gas operator, is admittedly different that say a consumer’s, or a stock analyst, or someone who is casually interested in unconventional shale development. I am required to look at each well as an accounting ‘unit.’ I can’t ignore some costs, and include others, I must include ALL costs in the accounting unit, from day one, including leasehold acquisition to initial drilling and completion costs, G&A costs, interest expense ( if I am dumb enough to borrow money to drill a well); all of it. If spending another $3-4M to re-frac these wells, over and above ALL costs to create the wellbore in the first place, results in sufficient total UR to make that unit profitable, halleluiah. Then the question arises, is that accounting unit profitable ENOUGH for me to provide equity to my shareholders, replace my reserve inventory, grow reserves and continue development of the same resource in such as a manner as to reduce debt, or keep from incurring more debt. That is my definition of success and sustainability. Found 2 wells that are either extremely outstanding refracks or they just tied into the main field take away pipeline. I feel these >60MMCFPD production rate unrealistic — they are probably better than the best monster shale gas wells IP in Utica. So far, the #1 shale gas well in Utica is Scott Run 591340 with unchoked IP of 73MMCFPD. Second well pic. Can only post one file (png) per post. When I try and get by well it just comes up blank, even ofter the working icon disappears. I tried picking the operator first and then by well but same thing. Sorry, figured it out. Was selecting by WELL on the advanced insights area (EUR tab)… comes up blank. Works on the well quality tab by operator just fine. Indeed the EUR overview only allows grouping the wells by a time dimension (month/quarter/year). In the well quality overview it is possible. If you encounter any issues, plz just post a screenshot and I’ll check it.